Abstract: Archery and crossbow guilds first appeared in the fourteenth century in response to the needs of town defence and princely calls for troops. By the fifteenth century these guilds existed across northern Europe. Despite this they have not received the attention they deserve, and have even been dismissed as little more than militias. An analysis of the uniquely detailed account books of the two Bruges guilds, the archers of St Sebastian and the crossbowmen of St George, reveals much about their social activities, and especially their annual meals. Feasts were important to the guilds in three main ways. Firstly, they demonstrated the guild’s status and wealth. Secondly, meals helped to strengthen the bonds of the community. The guild’s community could include not just members resident in Bruges, but also shooters from other towns and even leading noblemen. Thirdly, and in contrast to this, communal meals were an occasion to exhibit the hierarchy present within these guilds. Hierarchy is shown through the range of foods purchased, and through the seating plans preserved in the St Sebastian’s guild accounts. important marketplaces in western Europe. Though its economy was in decline, in 1450 Bruges maintained a population of over 36,000. As befitting a city with such cultural and economic prominence, Bruges had a strong festive tradition, many elements of which have been studied. The procession of the Holy Blood, in which a vial said to contain Christ’s blood was carried around the city walls, was one of the most famous in the Low Countries. Richer townsmen took part in the urban jousts of the White Bear, while religious organisations catered to all levels of Bruges society. Bruges was also the setting for noble celebrations: most famously, Charles the Bold’s marriage to Margaret of York in 1468 presented a spectacle John Paston compared to the court of King Arthur. The guilds of archers and crossbowmen, ostensibly founded for civic defence, were another important part of Bruges’ vibrant civic culture, but have received far less attention from historians. The origins of the archery and crossbow guilds of Bruges are unclear, but may go back to the late thirteenth-century militia. Over the fourteenth century the two communities, the archers of St Sebastian and the crossbowmen of St George, became important social groups. They received privileges, owned lands, and had their own chapels dedicated to their patron saints, all of which helped to make the guilds two of the most influential civic groups. The archers of St Sebastian and the crossbowmen of St George both kept account books. The crossbowmen’s accounts begin in 1445, with a gap from 1465 to 1470, and become fragmentary from 1481. A separate membership list was kept from 1437. 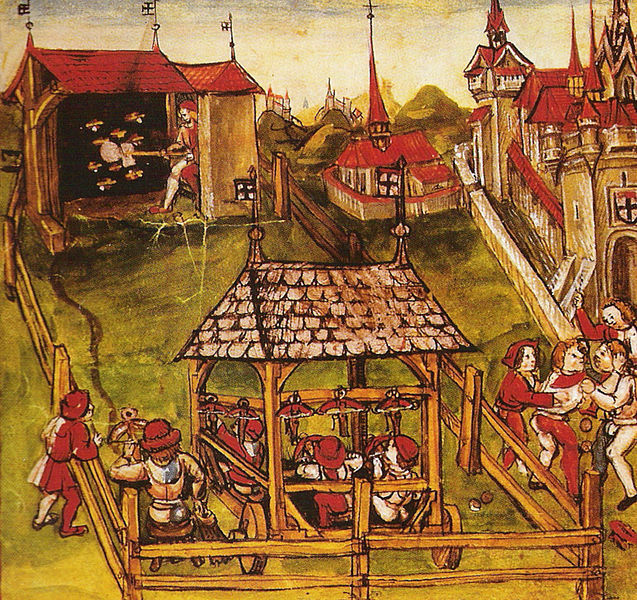 The archers’ accounts survive in four registers, covering 1454–6, 1460–5, 1465–72 and 1472–81. The last two of these, however, are incomplete. The accounts of both guilds provide great insight into guild life, membership and devotional activities, as well as the guilds’ annual meals, which are the focus of the present paper. Both guilds held two annual meals, one on their patronal saint’s day, and another following their annual shooting competition, known as the papegay.